2007- The school joined the local Meadville RoboBOTS competition the year of its conception (2007) with a bot called Pure Destruction. The bot was basically a gigantic steel-metal wedge with small circular saw blades on the blunt end, powered by drill motors. Being as this was the first year for a local competiton around here, the bots were rather simple. Pure Destruction was the only bot with an actual "active weapon" that year. 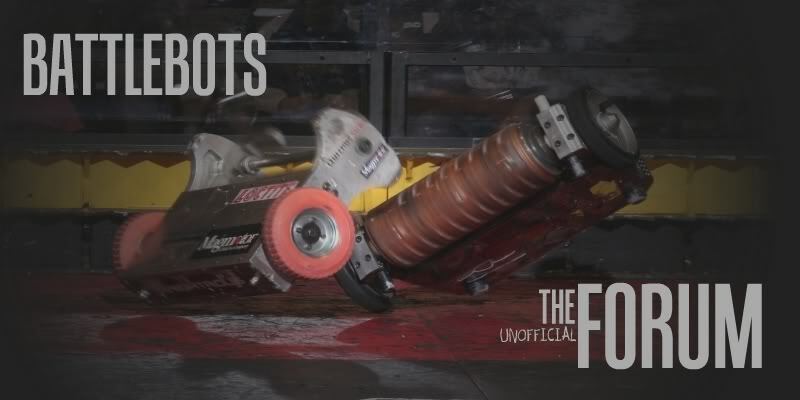 Pure Destruction left the competition with the "Coolest Bot" award. 2008- This year two teams were formed, and the bots Hornet and Jiblet were built. Jiblet was a small bot with a blunt steel blade (horizontal spinner) and Hornet had a long, thin drum with snowmobile picks for teeth, spun upwards to put the opponent on top then drive them around the arena. Hornet took 2nd place that year. 2009- After the success of Hornet the previous year, we decided to change the weapon a bit, go to a brushless weapon, and really kinda play around and see what different things could do. The bots Whizzer and Flinger were built this year, Whizzer being a wide beater-bar design, with Flinger being a horizontal top and bottom spinner. Whizzer took home the King of the Ring award. 2010- My personal first year having my own team, four bots were built this year. Whizzer II- slight modifications to the previous year. Resurrection- Flinger shell, modified to be a ramming bot with single steel spike. The Bull- My bot, basically a star-shaped ramming bot. No awards came home with us this year. 2011- This year we decided to try out a drum weapon, and overall enjoyed the experience, The bots "The General" and "Crossfire" were built this year, with the General having a high speed solid drum spun around 14k, and Crossfire having 4 spike-drum weapons, all spun off the same brushless. A unique design, but not so much when it came to being an effective combat bot.